This springform pan makes it easy to create delicious cheesecakes, as well as other special desserts like layer cakes and tortes. The mold is made by special high-carbon steel and characterized by high hardness and super endurance. Super thermal conductivity makes uniform heating and service life is more than 20,000 times. Xylan series champagne coating provided by American top-class coating brand Whittford is characterized by the ease of demolding and cleaning, wear resistance and endurance, and meets EU LFGB and American FDA standard for food grade. 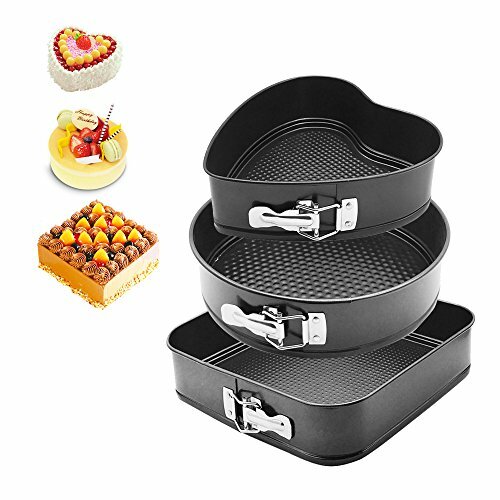 Perfect for baking individual desserts and recipes of Tarts, Cupcakes, Pies, Quiche, Brownies, Muffins , Pudding, Mini Cakes , Jello, Cheesecakes , Tartlets, etc. If you have any questions about this product by HOMOW, contact us by completing and submitting the form below. If you are looking for a specif part number, please include it with your message.